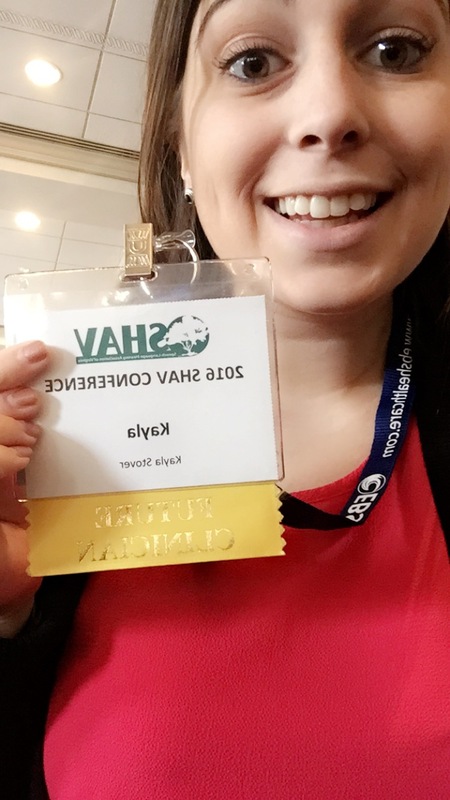 I recently had the pleasure of traveling to the Speech-Language-Hearing Association of Virginia Conference (SHAV) in Chantilly, VA. I spent two full days immersed in learning in various areas of Speech-Language Pathology. As you can tell by the photo, I was overly ecstatic to be able to wear a ribbon in honor of being a future clinician. As an attendee of the SHAV, I was able to select which sessions I wanted to attend from a pool of more than several dozen presenters. I chose to further my understanding and knowledge of the following topics: Autism, selecting core vocabulary for nonverbal students, the relation of swallowing to pneumonia, and so much more. I also learned a lot about how to become a clinician following graduate school. I was overjoyed that my entire cohort attended the conference, representing our University with 100% attendance. I am so thrilled to be part of a field that encourages continuing education; one in which Speech-Language Pathologists and Audiologists continuously strive to keep up with changing technology and research while always bettering themselves as service providers. This entry was posted by Kayla Stover on April 12, 2016 at 2:40 pm, and is filed under 2015-2016, Communication Sciences & Disorders. Follow any responses to this post through RSS 2.0. Both comments and pings are currently closed.